Why Seabirds Love To Gobble Plastic Floating In The Ocean : The Two-Way New evidence suggests that for a lot of birds, plastic actually smells like food. The reason for that involves a common kind of algae floating in the ocean and a "chemical scream." 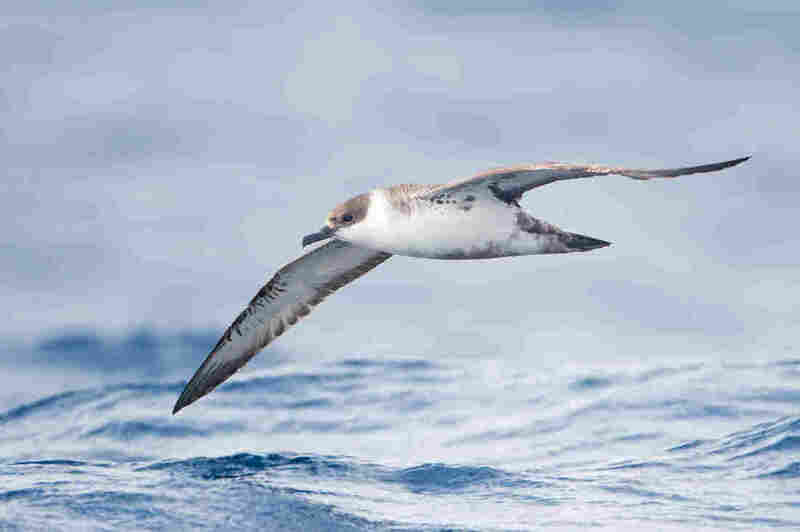 A great shearwater flies off the coast of Tasmania. It all comes down to a common kind of algae floating in the ocean. The algae is food for tiny animals such as krill — otherwise known as zooplankton. When the krill gobble up the algae, the algae emit a chemical called dimethyl sulfide. Biologist Matthew Savoca says it stinks up the place. It's actually a chemical scream. As he describes it, "The algae are sort of crying out, saying 'Oh my gosh, we're being eaten and can someone please help me.' "
That might sound ridiculous but, in fact, help does come — in the form of birds. When seabirds like shearwaters smell that chemical, they know it means tasty krill are in the water. "Think of it as like a dinner bell," Savoca says. "So if we heard a dinner bell ringing, the dinner bell would signify where we could find food. " Savoca and his team at the University of California, Davis, wondered if birds were accidentally eating plastic because there was stinky algae living on it. So they put plastic out to float around in the ocean. Then they took it to the university's food and wine laboratories — this is Northern California, after all. They got some weird looks when they stuffed plastic into equipment designed to track chemicals in fine wine. But they did get their answer. "Sure enough," Savoca says, "all this plastic reeked of that sulfur compound, likely due to the algae that coated it when it was out at sea." So the algae cling to the plastic, and when the krill eat them, the algae scream — chemically, that is. The birds smell it and that's their "foraging cue." They scoop up the krill and the plastic. The team's research appears in the journal Science Advances. Marine ecologist Chelsea Rochman at the University of Toronto says that, obviously, eating plastic isn't good for the birds — it's made with some harmful chemicals that aren't meant to be eaten. But the plastic also picks up other chemicals in the ocean that make it even nastier. "Plastic is a sponge for a lot of the chemicals that are in oil and the chemicals that are washing off from different sources, like pesticides and flame retardants and other industrial pollutants," Rochman says. Poisoning birds is a problem. But Rochman and Savoca say biologists suspect that other marine animals, such as fish, also could be eating the plastic for the same reason — and that could have consequences not just for fish, but for people who eat them, as well.